My friend does it. Yeah she promotes things like that, she did cheese last time. I got quite a few cheese vouchers. I imagine the cheese brand in question did not spend a large amount of money on some kind of sampling activity in order for their sampling staff to hand out the vouchers to their mates. 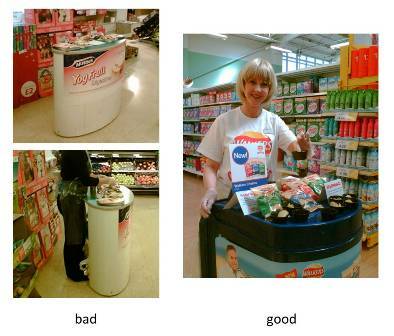 When instore sampling is done well (like the engaging lady sampling for Walkers I met earlier this year) it can help brand awareness, deliver key messages and drive trial. When sampling is done badly (like in the case of McVities), the brand manager might as well stand in the supermarket aisle tearing up fifty pound notes. It all comes down (yet again) to how the brand is delivered on the frontline. Which means that promotional activity isn’t something that should be bought on a cost-per-sample or cost-per-engagement basis. Because it seems that you really do get what you pay for and trained, engaged, motivated promotional staff (and the agencies that supply them) don’t come cheap. There are always going to be times when brands can’t control who delivers their brand messages – for example I understand that if you want to do instore sampling sessions in the actual aisle (or Mabel-with-a-Table as one SP bloke I used to know called it) of one supermarket you have to use their preferred inhouse supplier to execute it. So then the communications challenge becomes marketing to the marketeers. Whether that’s giving the promotional team the best possible briefing, using mystery shops to police and reward quality or just ensuring that your brand logo is plastered across every table and staff t-shirt, brands need to think not just about projected reach, but about how to maximise the quality of that reach. Because, ultimately, it all comes down to effectiveness. And effective promotional activity should in the end have an effect on the brand’s bottom line. *I’ve worked out it’s actually cheaper for my clients to pay for group tapes to be transcribed professionally vs. hours of me laboriously typing highlights at 30wpm and constantly rewinding the tape. I use PageSix.